Our Visit the Vulcan Day on 20 August 2017 provided another great opportunity to see Vulcan XL426 in its new home following the giant delta’s move to Hangar 6 at London Southend Airport earlier this summer. This event delivered on the promise to be bigger and better than previous Visit the Vulcan Days. Unfortunately the planned fly past from the Lancaster, Spitfire and Hurricane had to be cancelled due to technical issues at the Royal Air Force Battle of Britain Memorial Flight (BBMF). However the BBMF performed a number of fly pasts with a Spitfire PR XIX just after 1.00 pm, plus take offs and landings due to being based at the airport for the weekend. 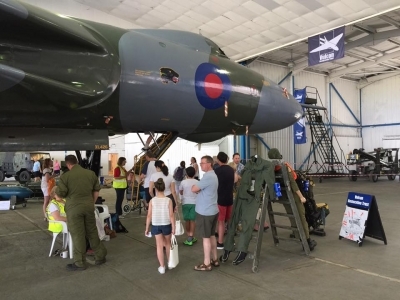 Our Visit the Vulcan Days are great days out for aircraft enthusiasts and the general public alike. The VRT Team was on hand to give guided tours of Vulcan XL426 and for an additional fee you could climb inside the Vulcan’s cockpit. Alongside XL426 were the cockpit nose sections of aircraft that served with the Vulcan during its time with the RAF, including a Buccaneer jet fighter-bomber, a Jaguar strike aircraft, a Hunter jet attack aircraft and a vintage Chipmunk trainer. Other displays included a rare WE177B nuclear bomb, carried by the Vulcan during its time with the RAF, as well as examples of the 1,000 lb high explosive bombs the Vulcan dropped on Port Stanley airfield during the 1982 Falklands Conflict. Also on display was the life raft which the Vulcan’s crew would have used had they had to bale out of the aircraft over the sea. Plus much more on view to keep the whole family entertained: historic fire engines, classic cars from the 1960s and ‘70s, a face painting stall and military vehicles. Burgers, hot dogs, ice creams and doughnut stalls will made sure no one went hungry and the beer stall was on hand to keep mum and dad refreshed!